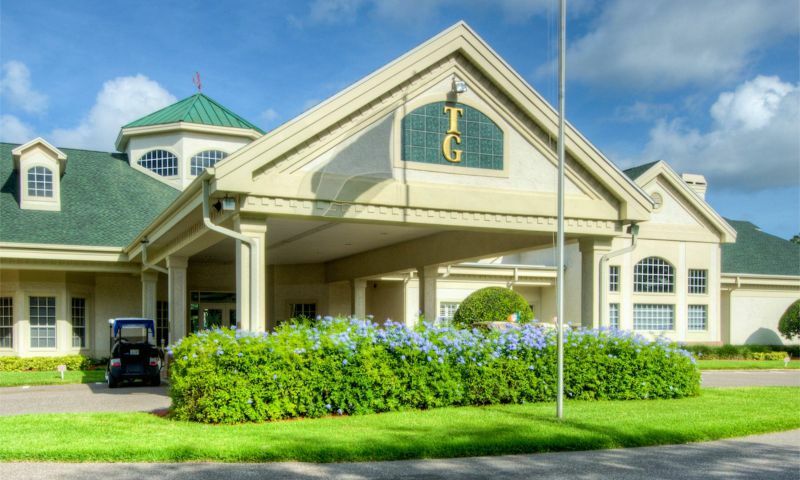 Timber Greens in New Port Richey, Florida is a deed-restricted, self-managed active adult community that was developed by U.S. Homes and Regency Communities. This gated neighborhood is comprised of 783 attached and single-family homes available on a resale-only basis. Timber Greens is especially known for its country club and 18-hole golf course. Other features of this low-maintenance community include an expansive clubhouse and well-designed homes. The clubhouse at Timber Greens is the central hub of activity for residents. For those who want to tone up or rejuvenate, residents have use of the fitness center for a minimal annual fee. It features treadmills, elliptical machines, exercise machines, exercise bikes and free weights. Residents can also participate in specialty classes like line dancing, Tai Chi, water aerobics, Zumba, and aerobic exercise. There are plenty of opportunities and space for hobbies at the arts and crafts room. Residents have use of a great room, card room, billiards, multi-purpose room and library. Additionally, the clubhouse has computers and a restaurant known as 19th Hole Bar & Grill. Outdoor amenities include a swimming pool, spa, and patio. Additional exercise options include two lighted hard surface tennis courts. The community offers a year-round tennis program that not only promotes fitness and competition, but social interaction and friendships as well. The coveted center piece of Timber Greens is its 18-hole, par-71 golf course by Ron Garl. It features a slope rating of 124 and is 6,133 yards from the longest tees. Homes at Timber Greens were developed by U.S. Homes & Regency Communities from 1994 to 2004. These attractive and reasonably priced villas and single-family homes offer between 1,300 and 3,850 square feet of air-conditioned space. The layouts feature two to four bedrooms, two to three bathrooms, living room and dining room combinations, eat-in kitchens, and screened lanais. Homes are available on a resale-only basis and some offer individual upgraded features. Timber Greens offers a maintenance-free lifestyle in an established golf community with many other amenities, activities and social events. For example, on-site tennis players hold tournaments throughout the year along with accompanying refreshment service. Timber Greens also has a bowling league that is comprised of 18 teams. An activities director organizes dinners, parties, dances, and professional and amateur entertainment shows. An annual homeowners' association fee covers general maintenance of the community grounds as well as lawn care and trash removal of all homes in the community. This low-maintenance lifestyle allows residents to make the most of everyday at Timber Greens. Since Timber Greens is adjacent to Jay B. Starkey Wilderness Park, residents often use the the park's walking and biking trails. New Port Richey is one of Pasco County's most popular areas with lots of retail establishments, banks, shopping plazas and restaurants. The community is located close to both State Road 54 and US Highway 19, which provide convenient access to malls and stores, fine and casual dining, entertainment venues, medical centers, Gulf beaches and Tampa airports. Popular shopping destinations in the area include the Citrus Park Mall, Gulf View Square Mall, The Shops of Wiregrass and the International Mall. Major cities in close proximity include Tampa, Clearwater and St. Petersburg. As an established community dating back to 1994, Timber Greens is a sought-after community for active adults and retirees in sunny Pasco County. There are plenty of activities available in Timber Greens. Here is a sample of some of the clubs, activities and classes offered here. U.S. Homes offered multiple villa models that are now available on a resale-only basis. These models were arranged in groups of two to six units with at least two bedrooms, one-and-a-half bathrooms, and an attached garage. These low-maintenance homes are perfect for active adults looking to downsize. Please Note: Not all floor plans are available at this time. Both U.S. Homes and Regency Communities offered attached duplex models. These homes offered two bedrooms, two bathrooms, and an attached garage with open floor plans and convenient single-level living. Please Note: Floor plans are not available at this time. Single-family homes were offered by both U.S. Homes and Regency Communities. With two to four bedrooms, two to two-and-a-half bathrooms, and an attached two-car garage, residents love these homes for their low-maintenance exteriors and modern designs. Please Note: Floor plans are not available at this time. We just bought here and even though we won’t be living here full time for a couple years we are absolutely thrilled. The neighbors and community are wonderful and wecolming . We love it! The clubhouse and amenities are great not to mention the golf course! Love it! Love it! Love the home, but $130 per sq ft is way out of line with other houses in the area! Timber Greens is a friendly neighborhood with nice people. We enjoy the events and getting together with our friends at the dances and dinners. The golf course is nice and the restaurant is great to have so close to home. We also like playing bocce and walking the trails. Our home is going on 15 years old so we'll be doing some new carpet and some fresh paint soon. Other than your basic maintenance the house is nice too. 55places.com is not affiliated with the developer(s) or homeowners association of Timber Greens. The information you submit is distributed to a 55places.com Partner Agent, who is a licensed real estate agent. The information regarding Timber Greens has not been verified or approved by the developer or homeowners association. Please verify all information prior to purchasing. 55places.com is not responsible for any errors regarding the information displayed on this website.